Here are some of the Infamous prisons of the World. The building of a penitentiary in the city of Taquarituba, countryside of São Paulo state, Brazil, is dividing the resident’s opinions. While some people fear a rising in city’s criminality, others believe that the prison will bring more job opportunities to town. Journalist Eros Alonso, 60, is against the installation of the complex. He claims that the government fails to invest in other greater public needs in order to expand the prison system. “We believe that our region needs other investments. We do not accept the prison. It is being imposed by the authorities. The entire region is already filled with penitentiaries, and we don’t have a good hospital, neither a public university. These are our real claims”, he says. The penal system of Venezuela is an embarrassment. Venezuelan inmates have opened their own nightclub and hosted friends and family at an inaugural bash complete with strippers and a light and sound show, a newspaper reported Saturday.The late-night party highlighted the plight of the crime-ridden country’s overcrowded penal system, where criminals often use bribery and intimidation to exercise virtual control over the facilities built to incarcerate them.The so-called “Yacht Club” at a prison on Margarita Island in the Caribbean boasts “professional sound, spectacular lights, air conditioning, strippers, bad girls and all the toys,” the inmates wrote in an invitation to their opening night gig, according to the El Universel newspaper.The party was attended by friends and relatives of the detainees, who publicized it through messages on social media, the newspaper reported. Check out the article describing the report here. Check out the fact sheets on women offenders in MA here. I am always interested in prison oversight and find the different methods to be fascinating. The UK has an extensive prison inspectorate, which uses several teams of expert inspectors to evaluate a prison. It then gives a rating (good, reasonably good, not reasonably good, or poor) in each of four areas (safety, purposeful activities, respect and dignity, and resettlement/reentry). Unsurprisingly, I believe Australia has picked this method up and I know that Canada, which does not currently have an inspectorate (it has a large ombudsman office), is considering it. At the first level key security measures like escapes and unnatural deaths will be checked. If any of these occur the prison will be classified as needing improvement, no matter how well it’s doing in the next two measures. At the next level internal prison issues like the number of complaints, drug testing results, assaults etc are measured. If these are not up to standard the prison will be classified as needing improvement. The third level measures some aspects of our ultimate goal of reducing re-offending, by increasing participation in programmes allowing prisoners to gain job skills and real jobs. They then use rankings of “Exceptional, Exceeding, Effective, and Needs Improvement.” You can see an example of their ranking of the prisons here. To me, this seems like a good start, but perhaps too superficial. There’s a big push in the US to have “data-driven” corrections – let’s boil everything down to a number, assign a weight, multiply, and boom, you have an effective evaluation of the prison. Of course, it doesn’t really work like that. You do need to use metrics (and I object to any prison inspection or evaluation system that is based purely on an inspector’s “feeling” about a prison), but prisons are complex and just looking at the numbers without further investigation often misses the contributing causes and connections between the numbers. It also opens the door for the prison to manipulate the numbers in order to appear better or simply under-report. Still, I’m all for public scrutiny and if this brings additional attention to important data such as assault rates, then that’s great. 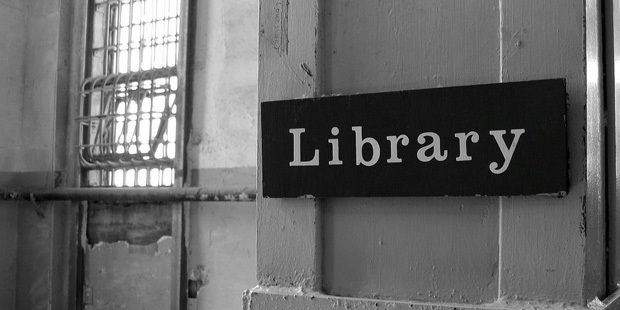 Recently I had the opportunity to visit a prison library with the UNC Special Libraries Student Association. After classes, we adventurers carpooled to the Polk Correctional Institute in Butner, North Carolina. Polk Correctional Institute is a state-run prison that houses over 900 male inmates. While the prison generally houses your typical criminal offenders, it also has a high security maximum control unit intended for the state’s most violent offenders. The inmates at Polk (aside from those in maximum security) typically have a daily schedule that includes meals, classes, recreational activities and other routines. They can even go to the prison library at a certain time and check out books and other materials! The energy of dance, love and unity! Celebrating the power of woman! Recidivism is at an all-time low in the state of Ohio as of a report released on February 22. According to an article from Corrections.com, the Ohio Department of Rehabilitation and Correction (DRC) announced its offender recidivism rate is at a record low, with only 28.7 percent of inmates returning to prison after release. How are Ohio prisons making this happen? Neither the “evidence-based programming” nor the “refined reception processes” are specified by the article. However, we at Second Sentence find it hopeful that trained rehabilitation professionals might be working with released or soon-to-be released inmates on how to better facilitate their re-entry into society.